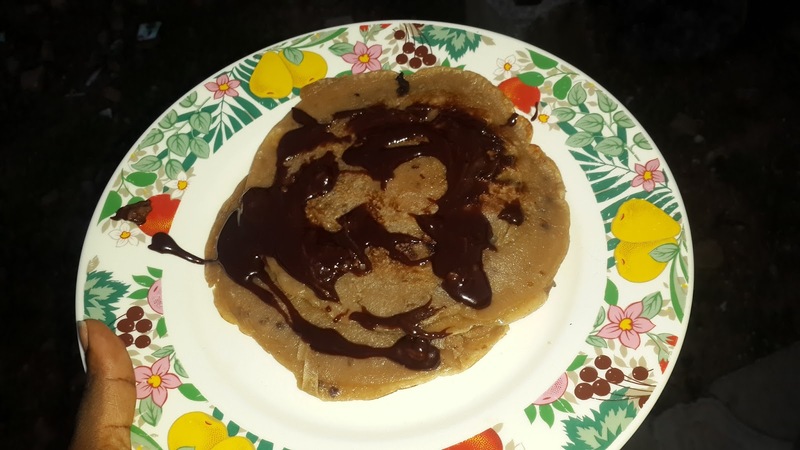 In commemoration of our anniversary, which was yesterday, I decided to make one of my favourite snacks of all time; Pancakes and this pancake is not your ordinary pancake. I added a little twist to it. I had recently fallen in love with Pure Bliss Chocolate biscuits and so I told myself why don’t you add this biscuit in the pancake. Not only did I add chocolate biscuits to it, I also melted chocolate and poured it all over the pancake. My oh my, oh so yummy. Anyway here’s the recipe for Crusted Chocolate Biscuits Pancake with melted Chocolate toppings. 1. 1½ cups of Flour. 2. 2 Tablespoons of Sugar: I don’t like too much sugar in my pancake so you could increase yours as you want. 3. 2 Tin of Milk: I don’t put water in my pancake, and I like the pancake batter very liquid so I put a lot of liquid milk. As with the above, you can adjust the milk and use less or water. 4. 2 Tablespoons of melted butter: do not use the butter in its solid form, make sure you melt the butter before you use. 5. ½ Tablespoon of baking powder: I don’t like too much baking powder in my pancake so I use less of this. With usage, you can decide the amount of baking powder you want to use. 7. A package of Pure Bliss Chocolate Biscuits. 8. 150g bar of Chocolate. 1. Sift the dry ingredients together. The dry ingredients are the flour, baking powder, sugar, and the grounded Pure bliss biscuits. 2. Make a well in the centre of the mix and pour in the butter, eggs and the milk. 4. Put a little oil in a frying pan. Make sure the oil is little; too much oil and the pancake will be too oily. 5. Scoop the batter and pour into the frying pan. Now the scoop you pour in the frying should depend on how big or small you want the pancake to be. 6. Leave the batter to cook unattended to for 2mins and then flip over. Cook until golden brown. 1. I unwrapped the chocolate in a small bowl and put it over a pot of boiling water, keep on stirring the chocolate until it is completely melted. 2. I allowed the chocolate to cool down a little before pouring it over the pancake. 3. I ate the delicious yummy pure bliss Chocolate Pancake with Melted chocolate toppings. 4. Enjoy and don’t forget to invite me when you are having one. LOL. Well now that you have the craving, you have a recipe to use. Make sure you invite me when you're done.